It took me a little longer to gather my final thoughts, mostly because I wasn't sure what I wanted to say. Being home for a few weeks, I've taken note that the stories I'm currently telling are a bit different than when we first got back. Now, the stories being repeated are the ones most deeply embedded in my mind. I certainly can't say we didn't encounter any difficulties. The mechanical difficulties caused delays that were more of an annoyance than anything else. But those faded quickly...about 10 minutes after we were back on the road. The heat related problems were more of a health threat and much more frightening. First, the absolute beauty of this country. Beginning with putting our boots in the Atlantic Ocean, everything, including the mundane, took on new meaning as it became part of the journey. From the buildings and cacophony of our Nation's Capitol, to the Virginia and West Virginia mountains, to the wide open mid-west heartland, to the majesty of the Rockies, to the "Loneliest Road In America" segment in Nevada, and ending the first leg of the ride with boots in the Pacific Ocean, it was nearly indescribable. Route 50 was my "bucket list" item, and it gave me everything I hoped for: Originally native trails, then Pony Express routes, today's Route 50 provides challenging riding on fairly well maintained and marked roads, coupled with unbelievable eye candy! For me, the highlights were in the west: Pikes Peak, the Nevada Desert and EVERYTHING about Utah! Riding the Cabrillo and Pacific Coast Highways from San Francisco to Los Angeles was relaxing and mostly familiar, as Juju and I had been on much of it before. The part we had not previously experienced was going through Big Sur. The mountain forest that sharply drops to the rocky Pacific coast line is something us easterners rarely get to see firsthand. Near Los Angeles, the western end of Route 66 is on the Santa Monica Pier. This marked our turn around point and for the first time we were headed east. Route 66, in L.A. is...well...let's just say difficult. In fact, 66 in most of California is difficult...poorly marked and poorly maintained. Once in Arizona, it was better road, but still tough to follow. This is where I got us lost by about 50 miles. Oatman,Arizona is a world of its own. A classic ghost town with wild donkeys literally running up and down the wooden sidewalks and dirt street. As Ed mentioned in his comments, the road from Oatman to Kingman was incredibly beautiful and obviously dangerous. This is where Ed and Nancy went down and their ride came to an unfortunate end (No major injuries, but hurt enough to make riding a motorcycle for another week a painful prospect. As of this writing, both are on the mend and the bike is in the shop for repairs). Juju and I continued along 66 to St. Louis before heading home, but it just wasn't the same without them. The second thing that stuck with me was the outright kindness of strangers. On three different occasions, we found ourselves in rather dicey situations. On two of these occasions, members of our group were suffering from heat exhaustion and nearing heat stroke. The third was the accident. In each case, strangers stopped to give us water, ice and comfort. I will always remember these folks; the concern they showed, and their willingness to help in whatever way they could. I will also always keep that in mind as I try to pay it forward. The third, and perhaps most important thing I took away from this adventure was gratitude! I am grateful to my wife for not only indulging me on this trip, but for being by my side to experience it with me. I am grateful to Ed and Nancy for sharing the adventure with us, and allowing us to share it with them. With almost 3,000 page views, I am grateful to all of you who took the time to follow the blog, especially the folks at Thunder Roads Pennsylvania Magazine for carrying the blog on their web site. And finally, even though I'm not an outwardly religious person, I am grateful to God for creating what we saw and experienced on this trip, and for making it possible for me to do it. When our friends Mike and Judy suggested riding our motorcycles west on Route 66 and back on Route 50, I was all in. But I was hoping Nancy would agree to make that long trek. Fortunately she agreed, and all we had to do was work out the details. My only suggestion was that we ride west on Route 50 so we could ride the Pacific coast highway south, and have the ocean on our right. Mike agreed, and it was time to set a date. We decided to leave mid July. Mike suggested going to Ocean City, Maryland first so we could ride Route 50 in it's entirety from Ocean City to Sacramento, California. Then we would continue to San Francisco to extend the trip from coast to coast...an even better idea as this was something I've had on my bucket list a long time. The beginning of our trip was somewhat eventful, but once we made it to Colorado, the past problems were forgotten and it was forward ho. Although I've flown over the Rockies many times it was always a dream of mine to ride through those mountain passes and experience them from the bike. It did not disappoint! The ride up to the summit of Pike's Peak was more than I had hoped for. Looking out and down from over 14,000 feet was an incredible experience. Check off one more item from the bucket list. When we got to Utah, it was even better than I had expected. The sights there were just AWESOME! Although we had done some portions of Route 50 in Nevada before, the vastness of the landscape was truly amazing. Now came California and the Pacific Coast Highway. Even though we had done it in the past by car, it's much different on a motorcycle. Next came the Santa Monica pier and the end of Route 66, or in our case the beginning of our journey back home. After getting lost a few times in Los Angeles, we were back on 66 in Pasadena heading east. I don't know exactly at what point the Mother road became the Mother fuc***g road, but it was apparent that California wasn't keen on maintaining Route 66. Especially with a nice new interstate running parallel to it. So we decided to wait until we got to Arizona to get back on 66. Here it became much more of what I had hoped for. The ride into Oatman, AZ was great, but this is one time where the destination was the highlight. 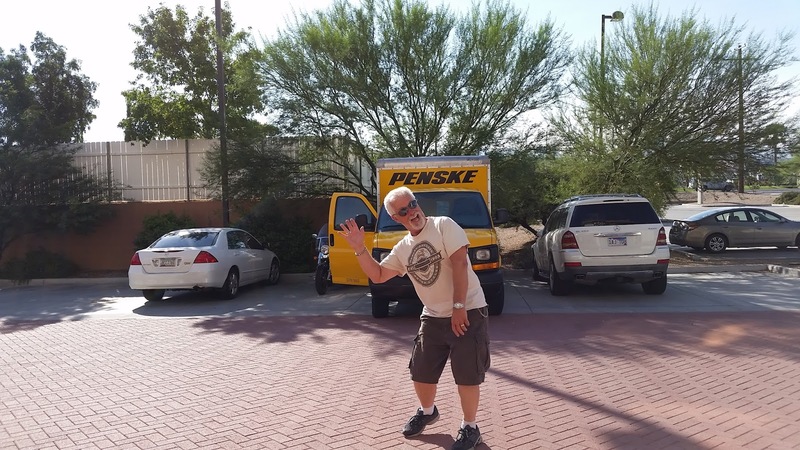 After several hours there, it was time to leave and head to our hotel in Kingman, AZ. Leaving Oatman and getting to the summit...I swear the view was over 100 miles. Another highlight for me was the old gas station at the bottom of the mountain. You may be thinking what's so good about that? Well, for me, it was the owner's fantastic collection of Rolling Stones albums; all signed by the Stones. Especially the one singed by Mick Jagger...when his signature was actually legible. Unfortunately, it wasn't long after that when the journey for Nancy and I came to an abrupt end. About 10 miles outside of Kingman we went down and ended up at the hospital for a few hours. I have no regrets, other than not being able to finish the trip by bike. I'd recommend everybody do it just once. This trip was at once the most challenging trip, as well as the most rewarding trip I have ever been on. From the delay of 10 days to get started, to the fantastic scenery and camaraderie of great folks, it was amazing. I was really struck by the kindness of strangers. As we sat on the side of the road either having a health related incident, or a broken bike incident, folks really cared and rendered what aide they could. Encountering the weather changes along the way really could have been life threatening. Laughing at each other for what we brought and what we did not bring. What we did, the things we saw and accomplished, has forged a bond forever. Knowing if we decide to do something it will get done! I will be parachuting for my 70th birthday! We have all heard bikers say "It's all about the f**king experience". Well that was certainly the case with this trip. I wasn't sure that I even wanted to make this trip. Six weeks on a motorcycle??? My non-biker friends were taking bets as to how long it would take before I booked a flight home. Well I not only surprised them, but I surprised myself as well. This trip was more than I could have ever imagined...jaw dropping scenery, mouth watering local food, and local people who made you proud to be an American. The experiences taught me that I am one tough grandma. I can not only survive extreme heat, sleet, high altitudes and "numb bum", I can laugh about them over a beer with my friends that evening. It doesn't matter if I have dirt on my face, or if I wear the same clothes for 3 days (underwear does not apply!). I am really disappointed that our trip came to an early end because of our accident. I am, however, really grateful that our injuries were not more serious. Thank you Mike & Judy for sharing all of this with us. O.K. I know. I'm a sucker for statistics. Finally, the Canadians stepped up! We knew you had it in you, but you didn't have to wait until we were almost done! The remaining 60% was from referrals, like Google, Yahoo, Facebook, etc. Individually, none of these was above 2%. Frankly, I didn't know there were so many ways to access the blog! The only statistic that surprised me was the number of comments. With the blog being viewed thousands of times by folks from all over the globe, only about 30 comments were made. Most of the comments were made by our friends, Fanko and Chuck. Somehow, I though there would be more! Anyway, thanks for following us. The final thoughts and photos are coming...the photos may take a while. Keep checking back. Since the last two days were on the interstate, I have taken the liberty of combining them. We left St. Louis Monday to a cold and overcast morning, but saw no rain. We had turned the horses to the barn, so to speak, as we headed for home. Now traveling on Interstate 70, one's concentration must now shift to other matters. Taking in the sights, sounds and smells of the surrounding countryside, has been replaced by keeping an eye on that semi you're about to pass, or the one about to pass you. The sounds are now of tires humming along the asphalt at 70+ miles per hour. And the smells are of diesel and gasoline exhaust. There are times though, when you can let your mind wander and think of all the things you've just done, and the people with whom you have shared them. This makes the time pass as you white knuckle your way across the remaining three States before coming back to Pennsylvania. 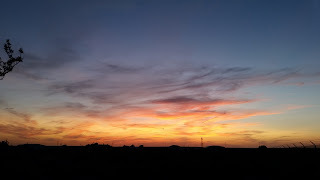 We finished the day about 360 miles to the east, in Dayton, Ohio. We spent some time in the hotel pool and hot tub before going to dinner...our last day of hotel accommodations on this trip. Tuesday morning's temperatures were no warmer than Monday's and the skies were even more threatening. Fortunately, It's been 19 days since we last had to put on the rain gear, and as dismal as it seemed, we saw no rain. That in itself is a great stretch of luck. Putting on an extra layer, we started out on the final leg, which consisted of just under 300 miles. More of the same interstate as we rode through the remainder of Ohio, then West Virginia and into Pennsylvania. We reflected on what we had done and were a bit saddened by the "lasts" we were now experiencing. We made our last diner stop, got our last gas, and rode the last miles before we pulled into the garage at home. Even as uneventful the last two day may sound, they are part of the entire package. They will become part of the stories we tell when we reminisce or recall for friends (who I'm sure we will bore to tears with the stories). It's good to be home, but it was VERY good being on the road, especially with the people in our little H.A.R.P. Group. When it was all said and done, we traveled through 23 States (6 of them twice), and the District of Columbia. We clocked 7,920.2 miles from the time we left our garage, until we pulled back in today. I'd say that was a pretty fair bit of riding! As stated in the previous post, there will be summary statements from each of the participants and a page will be dedicated to photos and video from the trip. It may take a while to edit the visual items, so check back...or better yet...go back to our home page, and just below the introduction paragraph, enter your e-mail address and click Submit. You will then be notified when anything new appears on the blog. Don't forget, we would love to hear your comments on the blog. A cloudless sky was every where we looked as a glorious sunrise was on display this morning. Temperatures were cool but comfortable and we headed out on Route 66 for what was now our final segment of the adventure. As it turns out, Missouri did a pretty good job on their share of Route 66. Although not as well marked as Oklahoma, it was very well maintained. One of the issues with road markings was addressed by a Missouri Welcome Center employee. She told us that the problem with signage is that the signs keep getting stolen. That's why they started painting the Route 66 logo on the road surface. Unfortunately, the more a road is maintained, the more often the logo is victim to resurfacing. Never the less, I think Missouri did have some of the prettiest roads so far. They were reminiscent of many of the roads back home in Western Pennsylvania. Tree lined, farm country, rolling hills and sweeping turns. A real joy to experience on a motorcycle. These country roads took us through unincorporated towns like Rescue and Plano, with it's one and only house. By comparison, Carthage, a few miles east, seems like a giant metropolis with it's 14,000 residents. And Springfield, with a population of over 150,000 is off the charts. Diner. A classic diner in the "classic" sense of the word. Chrome exterior with red, black and white interior. Walls adorned with photos of Elvis, James Dean and Marilyn Monroe. Diner fare on the menu did not disappoint. Shortly after lunch we were on Historic 66 and turned off at "Old 66". This little loop of about 12 miles took us down to Devil's Elbow. A portion of 66 that crosses the Big Piney River in the Ozark Mountains. A scenic drive that is well worth the slow speeds needed to negotiate the turns. Diner's like Skippy's 66 in Leesburg, and motels like the Wagon Wheel in Cuba dotted the route before we crossed U.S. 50. The first time since we left home that our route intersected. Before long we were in St Louis on the banks of the Mississippi River. Here, the river forms the border between Missouri and Illinois. Juju and I have been here three times before (not counting the ride out on U.S. 50). Each time we have tried to go up in the Arch. Once, we couldn't get in because of construction. Another time the cars to the top were under repair and the last time, they were sold out for the day and we were not staying. tickets at 2:00 p.m. for a 4:05 ride to the top. It took us until almost 3:30 to figure out how to get there. Almost every street leading to the Arch is under construction, closed and detoured. And they all seemed to lead in big circles. We could see the Arch, but couldn't get there. Finally, we spotted a tour bus. We figured if anyone knew how to get there, a tour bus would. We followed it down back alleys and through industrial facilities before it got to the riverfront parking area in front of the arch. From there, even the steps leading to the Arch had a detour, but we finally got there. The ride to the top took about four minutes and it was like being in a Ferris Wheel...I HATE Ferris Wheels! And there is absolutely no reason for there to be glass on the doors of the cars. All you can see is the skeleton of the Arch as your car bounced and rocked it's way to the top. River was wide and muddy on one side of the Arch. On the other side, the city of St. Louis was laid out in the late afternoon sun. wonderful employee named Danielle. 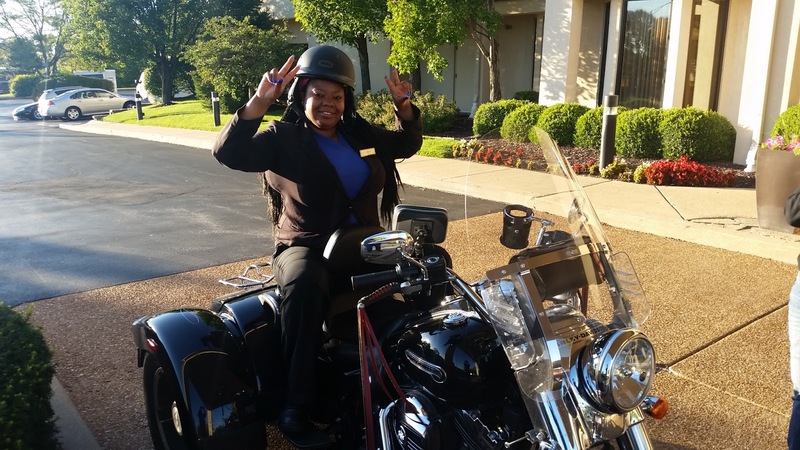 With personality plus, this is the kind of person you want to see at the end of a long day on the road. She was fun to talk to and Juju even gave her a ride around the parking lot on the trike. Marriott has a winner in this girl and should make every effort to keep her. As you may have noticed earlier, I mentioned that this was the end of our adventure. The original plan, discussed early in the year, was Pittsburgh to Route 50 in West Virginia. West on 50 to Sacramento and then San Francisco. South on the Pacific Coast Highway and then Route 66 to St.Louis before returning to Pittsburgh. We got a little ambitious by adding the Ocean to Ocean part on U.S. 50 which took us to Ocean City, Maryland. After that, we said, "well, we may as well go to Chicago on 66". The more than a week delay in West Virginia along with mechanical issues experienced by myself and Juju along the way, started to back us into a bit of a corner. We all became more aware of deadlines looming and business at home that needed attention. Ed and Nancy's accident and early departure took a lot of wind out of our sails, and Route 66 was at least on our way home to this point. It just doesn't seem right to continue to Chicago. We've done more than many people expected. We've done more than some people wanted us to. But I think we've done exactly what we set out to do. Four friends explored the country from coast to coast. We've seen more in the past 30+ days than most people see in a life time. I, for one, am proud of our accomplishment. The blog is not finished. It will take us a couple more days to get home, and hopefully it won't be boring. Ed, Nancy, Judy and I will all submit our final thoughts and there will be photos and videos posted for everyone to view. We all hope that you have enjoyed what we have done as much as we enjoyed documenting it. Please leave your comments and tell us what you think. We were awakened at about 4:00 a.m. by a light show being put on by mother nature. Lightning, thunder and heavy rains were on the agenda this morning. The storm was predicted to continue until about noon, so we decided to take a day off and booked another night here in Joplin. We figured that once the storm passed, and things dried up a bit, we could explore the city. Going on-line to do a little research reminded us we were in the middle of the "bible belt". The few things that were not closed on Sunday, were closing early today. So...Plan B...breakfast - nap - lunch - nap - dinner - laundry - bed time. Since there wasn't much to write about today, it would have be a great time to catch you up on some photos. Unfortunately, all of the really good photos went home in Nancy's camera last week. (If you haven't been following, go back to last Sunday's post). Our early start this morning was met with cool temperatures and overcast skies. The sky condition made it very comfortable riding today, but the winds were something to deal with. The clouds also made for some stunning scenery. Tucumcari was the next "big" small town in our path; a city that takes Route 66 seriously. The town is filled with memorabilia from the Mother Road. Unfortunately, because of our early start today, we passed through before anything was open. Before crossing into Texas at Glenrio, one of the last towns in New Mexico was Endee. I thought it was appropriate, since it was the "Endee" of the State. Here 66 joined Interstate 40 for a considerable distance. One of the biggest problems with following Route 66 is the lack of signage. You will see a sign on the interstate showing "Historic 66" next exit, so you take it. At the next intersection, you have to guess which way to go. Too many times I guessed wrong, I think, and was back on I-40. 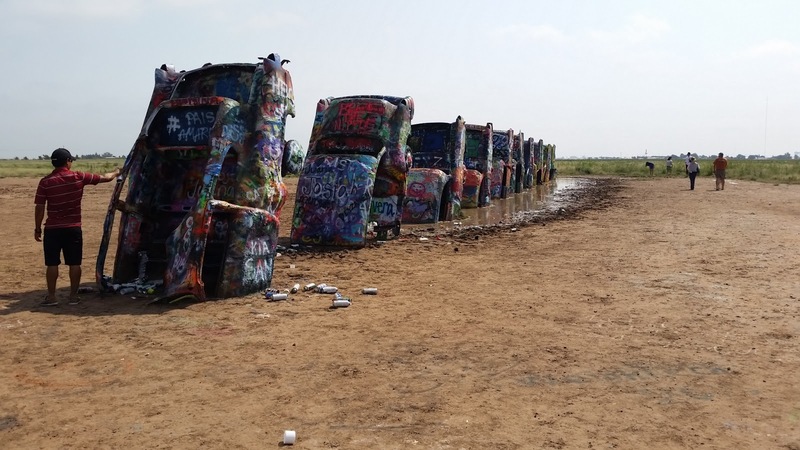 artist's idea to bury nine Cadillacs, nose down, in the middle of nowhere. Since it's inception in 1974, millions of visitors have come by and spray pained names, greetings and graffiti on the cars. 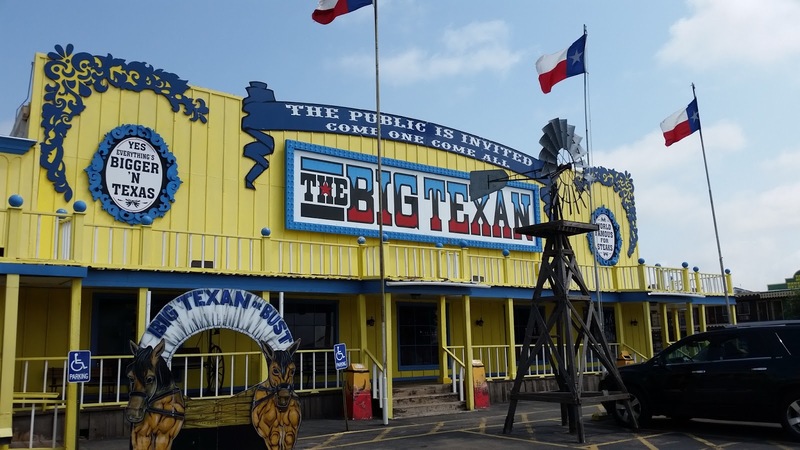 Not far down the road is the Big Texan Steak Ranch. A famous eatery that touts the FREE 72 ounce steak...If you can eat it, along with the accompanying shrimp cocktail, salad, baked potato, roll and butter in less than one hour. Currently, the record is held by the rather diminutive Molly Schuyler, who completed the task in a mere 4 minutes and 58 seconds. In doing so, she shattered the record set by Nathan's Famous Hot Dog Eater, Joey Chestnut, who did it in 8:52. To celebrate, she ate a second complete meal in 9 minutes and 59 seconds. That's 15 pounds of steak in less than 15 minutes. Moving through Texas and into Oklahoma, we once again saw a change in our surroundings. We were entering the great plains and the surface was markedly greener and land was obviously flatter. This, explains the wind we had to deal with on today's ride. There just wasn't anything to slow it down. Ending up in Elk City, Oklahoma, we relaxed for another early start tomorrow. We made about a 100 mile detour (intentional) today. About 50 miles north west of Albuquerque is Madrid, New Mexico. To get there, we rode the Turquoise Trail, a National Scenic Byway that connects Albuquerque with Santa Fe in the Ortiz Mountains. A beautiful ride up into the hills on sweeping roads that were edged in grasses and pine trees. Today was cool, requiring jackets...a welcome change from the 100° plus temperatures we have been experiencing lately. 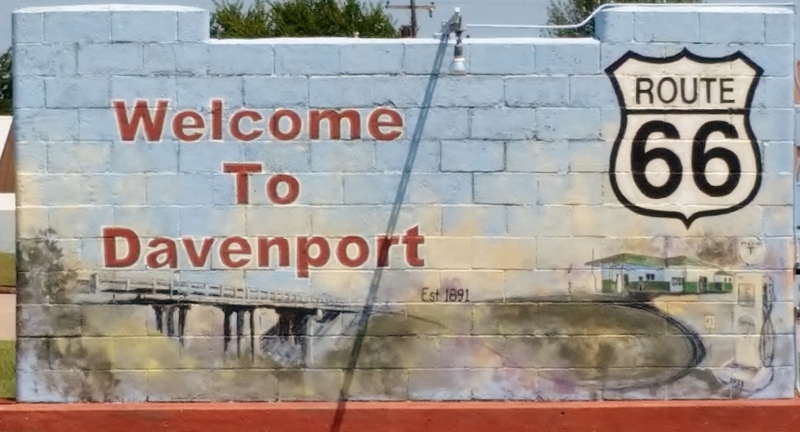 Made famous by the 2007 movie "Wild Hogs", this town has been re-inventing itself for several years. Once a mining community, it's 300 residents have become home to a variety of visual and musical artists. Coffee shops, cafe's, museums and galleries fill the business district that extends about a half mile. At the south end is the Mine Shaft Saloon, with some pretty good eats. Lunch today included the Green Chili Stew, which will light you up! Near the north end of town is the famous Maggie's Main Street Diner, from the movie. In true Hollywood fashion, it's not actually a diner, and never was. It is a store, that now sells Route 66, New Mexico and biker souvenirs along with Wild Hogs merchandise. Back on 66, we went another 100 miles to our stop for the night in Santa Rosa. Not a lot of miles today because of the late start. We'll see what happens tomorrow. Our stop in Holbrook last night was for the specific purpose of visiting The combined Painted Desert and Petrified Forest National Park. I urge you to click on the highlighted words in the previous sentence to learn more about this fascinating place. About a 25 minute ride from the hotel, this was one of the most interesting parks we've seen. This is another one of those days when the photos will do more to tell the story than words. So here are some pictures for you to enjoy. Having been in Albuquerque before, one thing we were not going to miss was having sopapillas at Little Anita's Restaurant in the Old Town section. Since our last visit about eight years ago, we have never been able to find another restaurant that makes them like they do. Like eating a cloud...with honey drizzled on it! adjustable ramp to load his bike into the rental truck. By 9 O'clock, we were saying good bye to our traveling companions as they headed home on 4 wheels. Juju and I got back on Route 66 and headed toward Flagstaff. As we moved eastward, and gradually upward in elevation, the tan earth gave way to green grass. The sage brush was eventually replaced by pine trees and their scent filled the air. General Store in Seligman, Arizona. Later, we made the obligatory pause to be "Standing on the Corner in Winslow, Arizona". By mid-afternoon we had arrived in Holbrook, Arizona, home of the Wigwam motel. An interesting place, but reviews had it too close to the railroad tracks to get a good night's sleep. Our primary motive for stopping here is to visit two parks we have yet to see...Petrified Forest National Park and Painted Desert National Park. After dinner, it was pool and hot tub time, but before retiring, we had this view from our hotel. We spent the day today lounging and allowing the medications to take effect on Nancy. She had a rough night, but after Ed got to the pharmacy this morning, all was right in her world...at least for four hours at a time. Juju and I spent a good bit of the day in the pool and doing a whole lot of nothing. So, the plans have changed a bit. Ed is a bit banged up...mostly road rash and a sore foot. Nancy is in a lot more pain. Nothing broken, but some deep tissue bruising and serious back pain. The medications seem to be working, but riding the bike for her is out of the question. Ed is going to rent a truck tomorrow morning and we'll load the bike in it with the help of the Kingman Harley-Davidson shop's loading ramp. They will then head for home. Juju and I will continue our ride along 66 for now. At the very least, we're going to go as far as St Louis, Missouri. From there, we'll decide if we continue to Chicago or straight on to Pittsburgh. It is very sad indeed that we will not be able to continue this ride together. However, we are all very happy to be able to say that it could have been a lot worse. In a week or two, everything should be healed up enough for the fun part of the stories to be told. I only hope that I can take some photos, which was Nancy's forte on the back of the bike. The ride will continue...as will the blog...stay tuned! Getting an early start helped a bit. Temperatures were only in the mid 80° range at dawn. We headed through Lake Havasu City on our way to Oatman to get back on track. We would have stopped to see the London Bridge, but it was too early. Once back on 66, we had 25 miles to Oatman. Here, we rode through the part of the desert that I find most interesting and beautiful. Still respectful of it's ability to destroy you, I am always fascinated by it's visual appeal. The hills rolled and the road curved. At times we could see down the mountain as the pavement was laid out in front of us for miles. For much of this ride, we were the only people out there, again reminding you of it's demand for respect. Arriving in Oatman, the fun began. The wild burros were there to greet us in the old mining town that has reinvented itself into a tourist destination. The donkeys beg for food from the tourists, who can buy "Donkey Chow" in almost any store in town. Everything there looks to be original. The buildings were laid out in the one block town sporting wooden sidewalks and a dirt Main Street, a Post Office, a saloon and a variety of souvenir shops. The burros were quite feisty today, as two males were fighting over which would be the dominate leader. They bit and kicked each other and ran up and down the street and the wooden side walks. The town's folk warned everyone the burros were wild and to stay out of their way to avoid being kicked or knocked over. 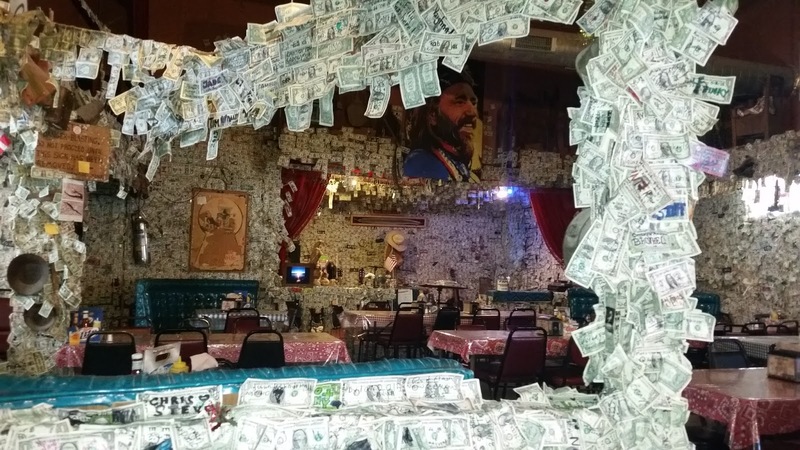 We had an early lunch in the Oatman Saloon, where the walls are covered with dollar bills. These bills are signed and decorated and marked in some fashion by the folks that visited from all over the world. Our server said that there were over 100,000 bills on the walls and ceiling. We decided to add to the collection. 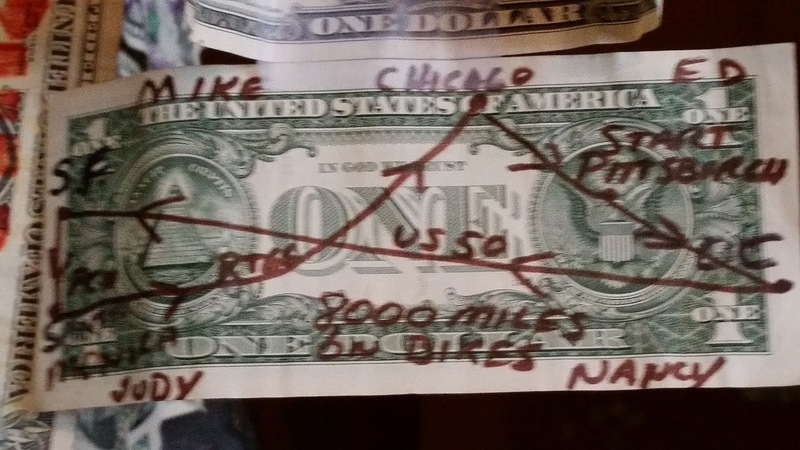 If you ever get to Oatman, look for our bill on the side of one of the napkin dispensers on the table. At high noon (of course), there was a gun fight in the middle of the street. Unlike most western town re-enactments, this one deviated from the authentic into the comedic. It was a fun show and raised money for the Shriner's Hospitals. It was time to leave and head further east for our next stop, Kingman. Since it was a mere 35 miles away, we knew we would be in the pool before the heat of the day began to blister. A short stop for a cool drink in kitschy gas station, that hasn't had gas since 1966, and we were back on the road...that's when it all went bad. A few miles down 66 we came across what is known here as a "wash". It's a dip in the road that intersects with a ravine coming from the mountains. When it rains, as it had several days ago, that ravine carries the water and it washes across the road. In it's path, it leaves gravel, dirt and mostly sand. In this particular wash, there was about six inches of the mix across the road. As I came over the ridge, I saw the sand and slowed quickly. I signaled Ed and Juju to slow down. I hit the sand and my front wheel wobbled severely but I got through and I looked in my mirror to watch the others. At about 10 mph, Ed's front wheel plowed into the sand and made an immediate and violent turn to the left. His bike tipped to the right and they both went down. Juju, on three wheels, went to the shoulder of the road to avoid running over Nancy and Ed. I ran back to the scene and it was obvious that Nancy was hurt. We got the bike up off of her and she described pain in her back on the right side. Some folks driving by stopped to add their assistance and called 911. These folks helped use Juju's bike cover as a tent to provide shade as Nancy sat in the hot sand where she had landed. Looking over at Ed, we noticed the blood running down his right arm. Checking more closely, we saw that he had some pretty nasty road rash on his back and arm. It seemed like an eternity, but first the Sheriff's officers arrived, then the Fire Department EMS, then the ambulance. They transported Nancy to the Kingman Regional Medical Center. We followed on the bikes. Ed's bike seemed O.K. except for the fender light and the front brake lever was twisted out of place. Nancy was taken for X-rays and a CT scan. Ed was scrubbed to remove the sand and dirt from his wounds. Additionally, he was now beginning to limp. Removing his right boot revealed a bruise that needed to be checked out. Several hours later, both were discharged. It seemed that nothing was broken, but there were still some deep tissue injuries that would limit movement and cause pain for some time to come. A taxi got Nancy to the hotel where the medications were apparently working, because she said it hurt, but she didn't care. We booked a second night here in Kingman to figure out what to do next, but it looks like Ed and Nancy won't be able to ride in their condition. We will keep you posted on our next move.